Here at Elanco, Inc., we commit ourselves in manufacturing quality products while also providing exceptional customer service. We pride ourselves in manufacturing the solutions to your problems by combining our extensive experience in design and fabrication. 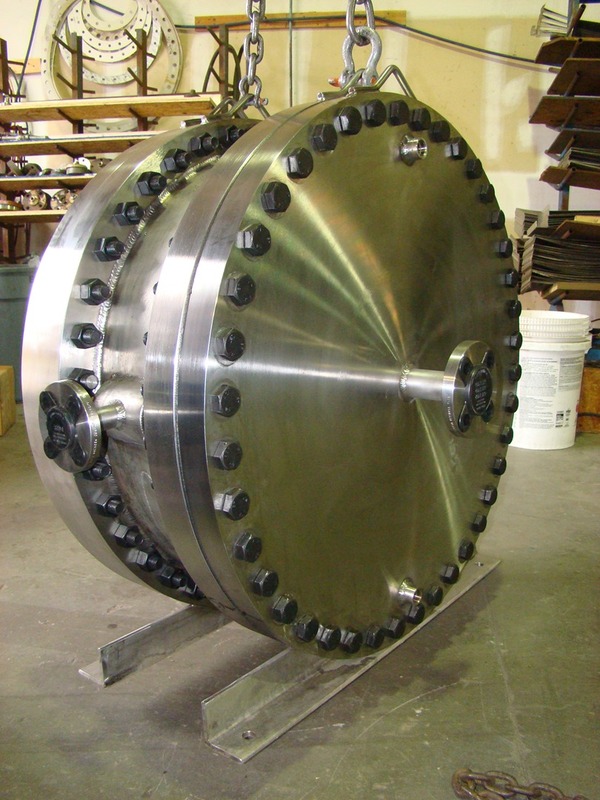 We offer customized work to handle your heat transfer and specialty needs. Elanco, Inc. holds ASME Certificates of Authorization to fabricate pressure vessels in accordance with Section VIII Division 1 U and UM, we can also build to PED and DOSH standards. 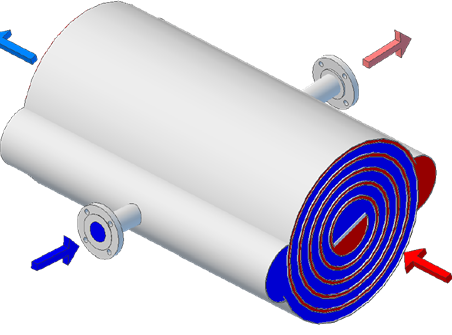 The "A" type is the conventional spiral heat exchanger. It has the basic rolled core with removable heads on both sides. Both sides are in spiral flow, true counter flow. The channels are separated with pins to keep the channel spacing. The pinned spacing and removable heads allow for mechanical cleaning and inspection of both sides of the SHE. 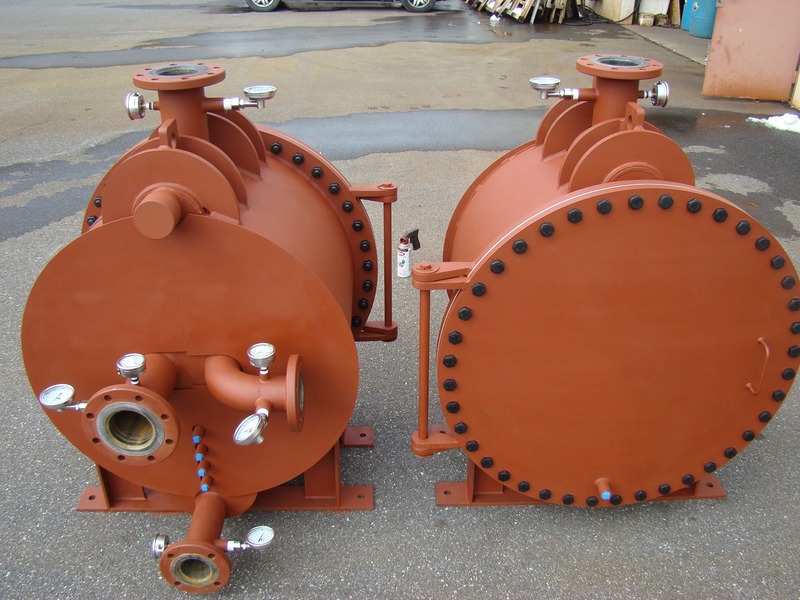 These are used for services that are fouling on both sides of the exchanger, and require cleaning often. 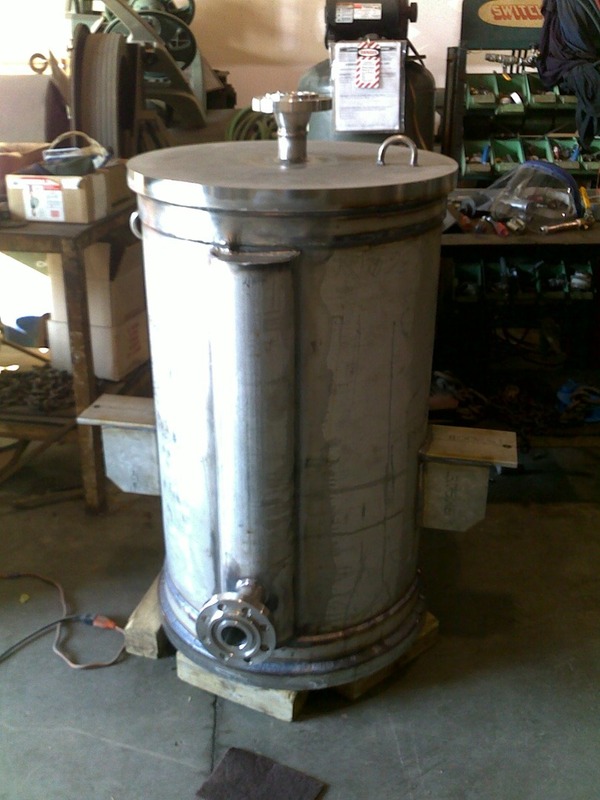 A special class of pin free units are manufactured for sewage treatment plants; and Elanco Inc has the most competitive sludge to sludge interchanger for thermal treatment of sewage available. The "B" type uses the same basic core as the "A" type, but has only one removable head. Again both sides in spiral - true counter flow patterns. It is used then only one fluid is fouling. The other side is most often the service side with cooling tower water or steam. Elanco has done a lot of work with cooling tower water, and has developed velocity - temperature - pressure drop standards for SHE use when mechanical cleaning is not an option. By using high velocity in the channels, the cooling tower water will not foul the prime surface by more than f+.0005, for stainless steel. Annual descaling returns unit to new and clean, and is accomplished with a chemical descaler. The "B" type is substantially less costly to produce than an "A" type. The "C" type begins with the same basic core as an "A" type, the unit is all welded and has no removable heads. Both fluids need to be relatively clean. There are two separate reasons for a "C" type construction. 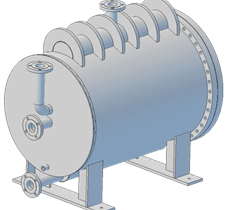 One, it is the least costly SHE, it has all the advantages of a spiral heat exchanger, true counter flow, can handle solids, small, compact, etc, and it less costly than one with removable heads. The second reason is Elanco has developed a super strength all welded version that can handle cycling and huge temperature shock. The all welded unit is very useful for high and low temperatures where gaskets become a problem. These are applications that SHE explicitly avoided before. The "C" has been used for high temperature gas to gas, for cooling heat transfer oils with liquid nitrogen, and for heating freezing xylene with steam. So advantageous is the "C" type to temperature shock, it has replaced U-Tube S&T units that failed due to the tube bundle rotating in the shell from the thermal stress. The "D" type is a hybrid, utilized both axial and spiral flow patterns. 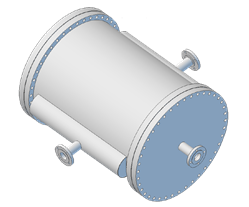 This design is extensively used in partial, vacuum and atmospheric knockback condensers. Most applications have the vapors entering the top of a vertical SHE axially, which exposes the flow to a large condensing surface area. The reduced flow than enters a spiral path that will subcool and separate the vapors/non-condensable, from the liquids. Elanco Inc has developed new advanced design codes for partial condensers that allow these units to smaller. The new codes have made the premier suppliers of low pressure and partial condensers. 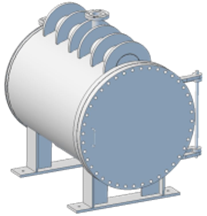 Type "DS", This type of heat exchanger is designed specifically for high solid applications where fouling is of utmost concern. 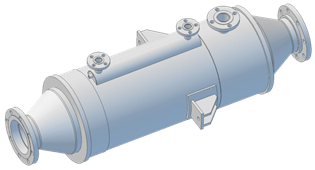 Elanco DS heat exchangers utilize pin free options, free flowing inlet and outlet transitions, and several cleanout features. 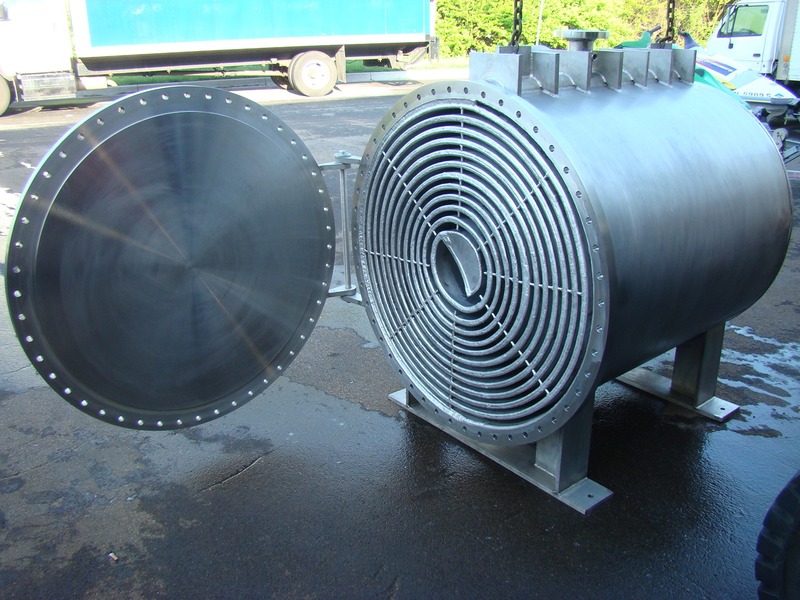 These heat exchangers are commonly found in the Municipal Waster Water Industry as sludge heaters for anaerobic sludge digesters. 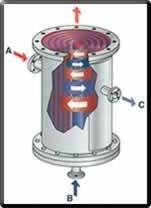 The "E" type spiral heat exchanger has one side in spiral flow and on side in axial flow. This arrangement is used for condensing with no subcooling, and for very large volume flow rate, (usually a gas), which are on the axial side. The advantage is the ability to expose the flow to large surface areas, with little pressure loss. The flows are in cross flow, not counter flow. 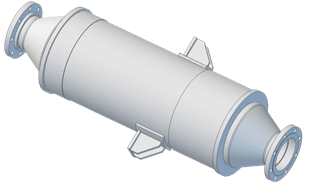 The axial side has fouling similar to a shell and tube heat exchanger, and the spiral side must be all welded construction. Elanco Inc can manufacture spiral heat exchangers in stainless steel, (standard), or in a variety of high alloys such as AL6XN®*, Alloy 600, and C-276. 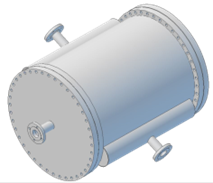 Elanco has both "U" and "UM" stamps for ASME Sec VIII, Div 1. pressure vessels. All welding at Elanco Inc is with the TIG method to assure the best quality weld.